In the latest indignity to befall the bank's employees, in a memo sent by Deutsche Bank CFO James von Moltke, the biggest European bank - if certainly not by market cap - urged employees to "take every opportunity to restrict non-essential travel" until the end of the year adding that "with your help, we will meet our cost-reduction targets." As Bloomberg notes, the travel curbs are the latest example of the cost-cutting drive under new CEO Christian Sewing, which has targeted perks such as first-class tickets - both for airplanes and trains - and even daily fruit bowls. Sewing vowed in April that he will keep expenses below 23 billion euros ($26 billion) in 2018, mostly by cutting at least 4,000 jobs by the end of the year, and likely many more. Having failed at boosting revenue growth, losing many of its rainmaker MDs in a period in which the bank paid out no bonuses, the bank has instead decided on instilling a more austere attitude toward travel - an essential element of Sewing’s and von Moltke’s effort to cut non-compensation expenses. It gets worse: in July the CFO asked all employees to submit their own cost-cutting proposals. More than 500 submissions were received during the first 24 hours. "We are grateful for the many ideas contributed by employees,” von Moltke wrote in the memo. “Among these, travel expenditure is one of the most frequently-raised topics." 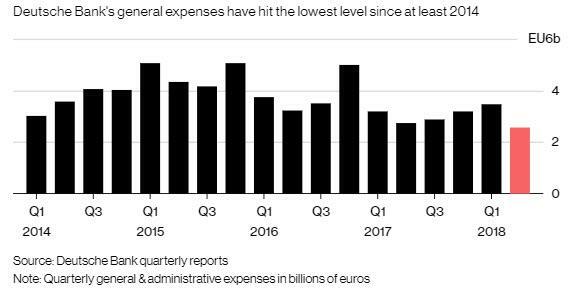 The good news, if not for the company's employees, is that DB's general expenses have tumbled to the lowest level since 2014, clocking in at €2.55BN.